An epidural is an injection of a local anaesthetic and/or other pain-relieving medicine into a space that surrounds your spinal cord. It temporarily numbs your nerves to give pain relief. This topic covers epidural injections that you’ll have during, and sometimes after, an operation. We have a separate topic about epidural injections for lower back and leg pain. Epidural anaesthesia, which is also known as regional anaesthesia, stops you feeling pain without making you go to sleep. You can have epidural anaesthesia instead of general anaesthesia for some types of surgery, such as surgery on your pelvis or legs. This means you’ll have less chance of the risks and side-effects of general anaesthesia such as feeling sick and vomiting, or damage to your teeth (from the equipment that’s used). Or you can have a combination of an epidural and a general anaesthetic. The epidural can be left in for a few days after your operation to give you continuing pain relief. An epidural isn’t suitable for everyone – ask your anaesthetist if it’s an option for you. If you’ve had an operation on your back before or have a blood-clotting problem, it might not be suitable. Tell your anaesthetist if you're taking any blood-thinning medicines such as warfarin. They’ll discuss your care with you before your procedure, including what the epidural involves. There may be some differences from what we describe here depending on your individual needs and particular operation. The points below list the pros and cons of having an epidural for surgery and pain relief. They cover having an epidural on its own – not combined with a general anaesthetic. These lists may help you weigh up what’s important to you and help you make a decision. An epidural doesn’t have the side-effects of a general anaesthetic, such as feeling sick or vomiting, damage to your teeth and a sore throat. Epidural anaesthesia seems to reduce the amount of blood you lose during surgery compared to general anaesthesia. You’ll stay awake during the operation so will recover faster than if you’d had a general anaesthetic. There may be a lower risk of deep vein thrombosis (DVT) compared to general anaesthesia. It can give you better pain control, which can begin immediately after your operation. There’s a risk of getting a headache. Although you can also get a headache after a general anaesthetic, it can be more painful after an epidural. There’s a risk of serious nerve damage, infection or bleeding in your spine after an epidural. This can potentially be life-threatening or cause permanent damage. But these complications are rare. You may prefer to be asleep for your operation. But it’s possible to have a sedative with an epidural to make you sleepy. There’s a risk that an epidural may not block pain as well as your surgeon and anaesthetist expect. Your anaesthetist will only allow your surgeon to begin the operation when they are satisfied that it’s working well and you’ll have no pain. For more information about side-effects and complications that can happen, look at our sections on side-effects and complications of an epidural for surgery and pain relief. Your spinal cord is the main nerve pathway of your body. It runs through a protective channel within the bones in your spine (your vertebrae). It’s surrounded by three layers of tissue called the meninges. Fluid called the cerebrospinal fluid lies between the inner two of these tissue layers. Cerebrospinal fluid cushions your spinal cord. Just outside the third tissue layer (called the dura) is the epidural space, which is very close to the nerves. Your spinal cord carries signals in the form of electrical messages between your brain and the rest of your body. All along your spine, nerves leave your spinal cord to go to specific parts of your body. Nerves to the lower part of your body leave your spinal cord in your lower back, for example. Your anaesthetist will use a needle to put a small plastic tube (called a catheter) into the epidural space in your back. They’ll inject the anaesthetic through this tube. This will temporarily block the feeling in your pelvic area and legs if they put it in your lower back. They’ll be able to control how much feeling you lose by selecting the amount, strength and type of medicine they use. 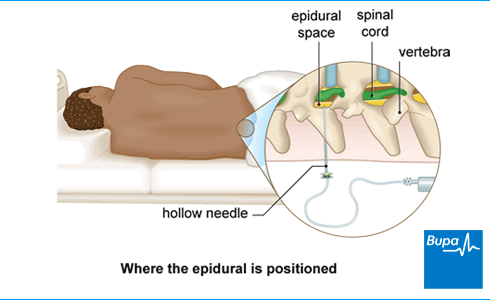 An epidural injection is for short-term pain relief, an infusion is for continuous pain relief. If you need short-term pain relief, your anaesthetist will use a single injection of local anaesthetic into your epidural space. How long this lasts will depend on the medicine that was injected – ask your anaesthetist for information. Your anaesthetist can also keep the catheter in your epidural space and attach it to a pump to give you a continuous flow of pain-relief medicine. This is known as an epidural infusion and is useful if you’re having a longer operation. It can also give you pain relief over several days after an operation. You might be given control of the infusion, which is called patient-controlled epidural analgesia (PCEA). You control the flow of medicine by pressing a button on an epidural pump. The pain-relief effect takes a few hours to wear off after the pump is stopped. Your anaesthetist will discuss with you what will happen before, during and after your epidural. Feel free to ask as many questions as you need to. No question is too small. This is your opportunity to understand what will happen and find out about the risks, benefits and any alternatives. You’ll need to give your consent for the procedure to go ahead. You’ll usually do this by signing a consent form. If you’re having an epidural without general anaesthesia, you’ll stay awake during the procedure, but your anaesthetist may also offer a sedative to help you relax. This will make you feel sleepy. Sometimes the two are combined. If you need pain relief immediately after your operation, an epidural is one option. Your anaesthetist may give you other painkilling medicines, such as morphine. Or they may give you morphine into a vein through an intravenous drip, which you can control. This is called patient-controlled analgesia (PCA). Your anaesthetist will ask you to lie on your side, draw your knees up to your tummy and tuck your chin in. Or they might ask you to sit up on the bed and lean forward. Both positions open up the space between the bones in your spine (your vertebrae). This will make it much easier for your anaesthetist to put the epidural in. Your anaesthetist will press on your back to feel for specific bones in your spine to select the point where they’ll inject you. They’ll clean the skin on your back with a sterilising solution and give you an injection of local anaesthetic to numb the area. They’ll cover your back in a sterile drape, which has a hole in the middle where they’ll do the epidural. Once your skin is numb, your anaesthetist will pass a larger, hollow epidural needle into the epidural space. When the needle reaches the right spot, they’ll put a tube (catheter) through the needle. Your anaesthetist will then remove the needle, leaving the catheter behind. They’ll use some tape to hold the catheter in place. Your anaesthetist will inject local anaesthetic and/or other pain-relieving medicines through the catheter into the epidural space. They might attach a pump to the catheter to give a continuous infusion of medicines. It's really important to stay still when your anaesthetist is inserting the epidural needle . But do tell them if it hurts. This will help your anaesthetist to give you the epidural safely. When you no longer need epidural pain relief, your anaesthetist will carefully remove the catheter and cover the area with a plaster. You won’t normally have an epidural left in for longer than three days. After an epidural, you’ll need to rest until the effects of the anaesthetic have worn off. The feeling and movement should return to normal when your anaesthetist stops the epidural but it will depend on what medicines they used. You might not be able to feel or move your legs properly for a few hours if you had an epidural with a pump. Don’t try to stand until your doctor or nurse says you can. You won't get the drowsiness that usually comes after a general anaesthetic unless you had a sedative. You might have persistent backache after your operation. But you can get this from simply lying on a firm, flat operating table – it isn’t caused by the epidural. It might be sore where your anaesthetist put the needle in your back and you might have a bruise, but this usually settles. Sometimes, your anaesthetist might need to remove your epidural catheter tube and put it back in again to make it more comfortable for you. If you have backache after your operation that gets worse, contact your surgeon or the hospital. Although it’s not very likely, it’s possible you may have an infection. Also contact them if you start to feel weak, numb, or have any problems with your bladder or bowels. Side-effects are the unwanted, but mostly temporary effects of a successful procedure. Common side-effects of an epidural include the following. Not being able to pee. This can happen if the nerves to your bladder are numb. You might need to use a catheter until the effects of the epidural wear off. A catheter drains urine from your bladder through a thin tube and into a bag outside your body. Feeling sick and vomiting, but this is less common that after an epidural than after a general anaesthetic. A drop in your blood pressure. Nurses will check this regularly. If it drops, you might be given medicines to raise it back up to normal. Losing strength or control of your muscles. You might not be able to move your legs or arms, depending on where you had the epidural. This will soon wear off. Pain. Sometimes the epidural doesn't relieve pain as expected and you might need to have a top-up dose or use another method of pain relief. Itchy skin. This can be treated with medicines if you need them. Redness or a bruise on your skin where your anaesthetist put the epidural needle in. This is when problems occur during, or after the procedure. Complications of an epidural include the following. A headache. The epidural injection may puncture the membrane that covers your spinal cord and cerebrospinal fluid can leak out. This means there’s less fluid around your brain, which can give you headaches. If you get a headache, you might need a blood patch. This involves your anaesthetist injecting some of your own blood into your back. The blood will then clot and seal the hole. An infection. This is rare because your anaesthetist will clean your skin before they put the sterile needle in your back. If you get an infection, you will probably need to have antibiotics. Bleeding. Very rarely, blood clots can form in the epidural space, which can cause a permanent injury if not noticed. You’ll be monitored to reduce this risk to a minimum. Nerve damage. You might lose the feeling in part of your body. In most people, this gets better after a few days, weeks or months. Rarely, it may be permanent. Difficulty breathing. Some medicines used in epidurals can make your breathing slow or make you drowsy. You’ll have treatment if this happens. Which painkillers are injected in an epidural? Which painkillers are injected in an epidural? As well as local anaesthetics that numb your nerves, you might be given medicines called opioids to relieve pain. Pain-relief medicines, such as morphine, fentanyl and diamorphine, belong to the opioid group of medicines. In an epidural, they can be used alone or in combination with a low dose of local anaesthetic. The medicines act on your spinal cord to block the way in which pain signals are sent from your body to your brain. Local anaesthetics and opioids work together so that lower doses of each can be used. The type of opioid medicine you have will depend on how much pain you have, and on your medical condition. Does an epidural make me feel groggy? Does an epidural make me feel groggy? It will depend on the type of medicine your anaesthetist gives you. If you have a sedative or strong pain-relief medicine such as morphine or diamorphine, it can make you feel drowsy. Morphine and diamorphine can also cause a temporary drop in blood pressure but the team caring for you will monitor you for this. Will I be aware of what the surgeon is doing? Will I be aware of what the surgeon is doing? You’ll usually have a surgical drape or shield put over you to hide the area being operated on. So you won't be able to see what your surgeon is doing. For some procedures, you may be able to watch the operation on a video monitor if you want to. You’ll be able to hear what’s going on. If you have an operation under epidural anaesthesia, you’ll stay awake. If you’re having an operation on your legs, pelvis or tummy, you’ll have an epidural in your lower back. You won't feel anything from your waist down, but you may get a sensation of pushing or pulling during the operation. Since you’ll be awake, you may be able to hear the sound of any instruments that are used during the operation. And you will be able to hear the surgical team talking. If you would prefer not to hear anything, ask a nurse if you can listen to music through headphones. Having a sedative before your operation to help you relax can affect how much you remember.